Desh Bhagat University Faculty of Law organised a guest lecture on 'Ethics in Public Life and the Role of Lok Pal and Lok Ayukta’ to enhance the knowledge of the students. 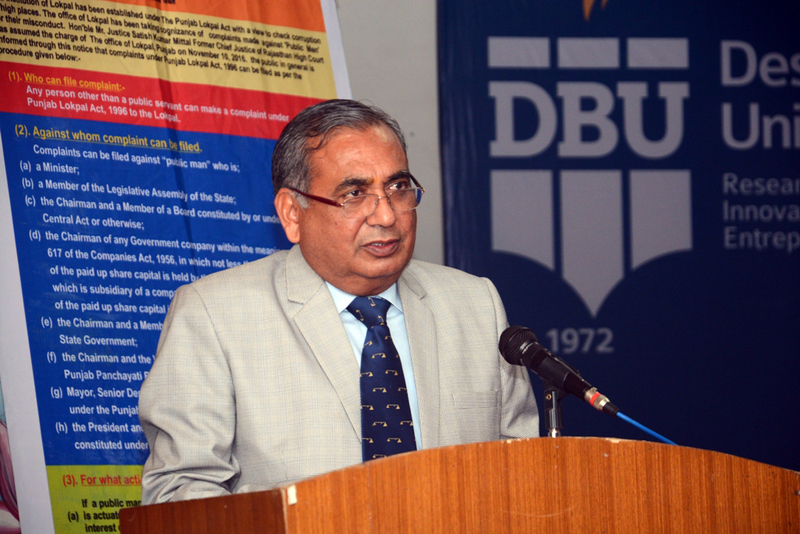 Lokpal of Punjab, Justice S. K. Mittal (Retd.) was the Chief Guest and the keynote speaker on this occasion. Students of all thelaw classes attended it. 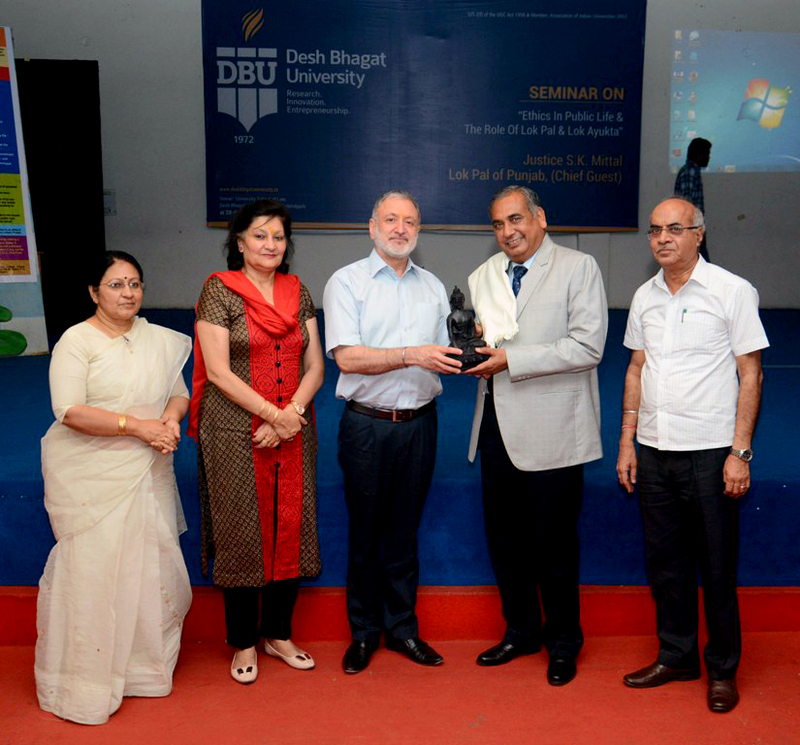 University Chancellor, Dr. Zora Singh welcomed the chief guest and all otherguests. 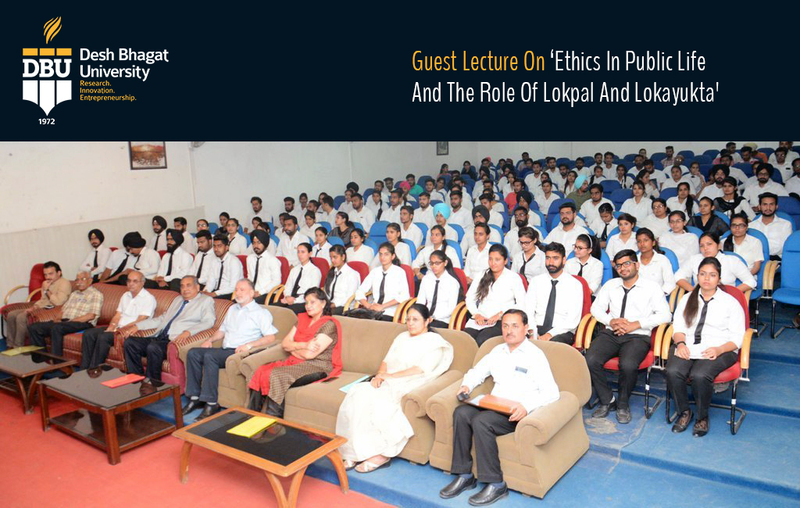 Speaking on the occasion, the Lokpal of Punjab, Honurable Justice S. K. Mittal (Retd.) said that India is a largest Democracy in the world and the institution of Lokayukta and Lokpal further strengthen it. He asserted that for corruption free society we have to take some bold steps. He also advocated that press should be strong and free enough to take a stand against every type of corruption. No doubt Good Governance, RTI, Transparency, Free Press, Rule of Law etc. helps in curbing the problem of corruption but actually morals and behaviour of an individual plays an effective role. So, the need of hour is to take a pledge not to indulge in unlawful activities by giving and taking bribery, by undue preferences etc., he insisted. While interacting with the students he congratulated the law students for choosing a challenging and noble profession. He said that the field of law is very challenging nowadays and every professional has to have good knowledge about various sections and provisions of country's laws. 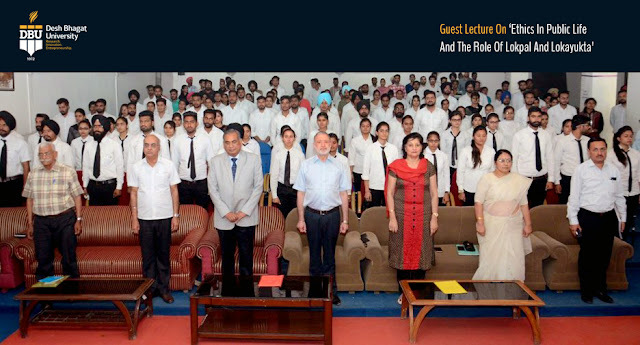 He also inspired the students to work hard and to adopt a professional approach to be successful. He said that a law professional has a lot of options to choose a career from, and good theoretical and practical knowledge is a must for law professionals. The students evinced a keen interest in the lecture and during the interactive session, they asked numerous questions on the topic which the learned speaker answered to their entire satisfaction. During the programme, a short play, a quiz contest and debate were also held. Pro Chancellor Dr. Tajinder Kaur thanked the chief guest and other guests for sparing valuable time and sharing their views with the students. Vice Chancellor Dr. Virinder Singh said that such lecturesadd to the knowledge of the students and enhance their self-confidence. Among others, Directors of different faculties and Law faculty members were present on the occasion.